Does Your Christmas Taste, Smell, Feel and Look Like Mine? Doubt it. When we think of the different ways Christmas is celebrated we generally think nationality differences and continental differences. Right here in this country Christmas is celebrated in dozens if not hundreds of different ways. Maybe you go to Rockefeller center to ice skate, or to the Plaza in Kansa City (with three hundred thousand other people) to see the lights come on. 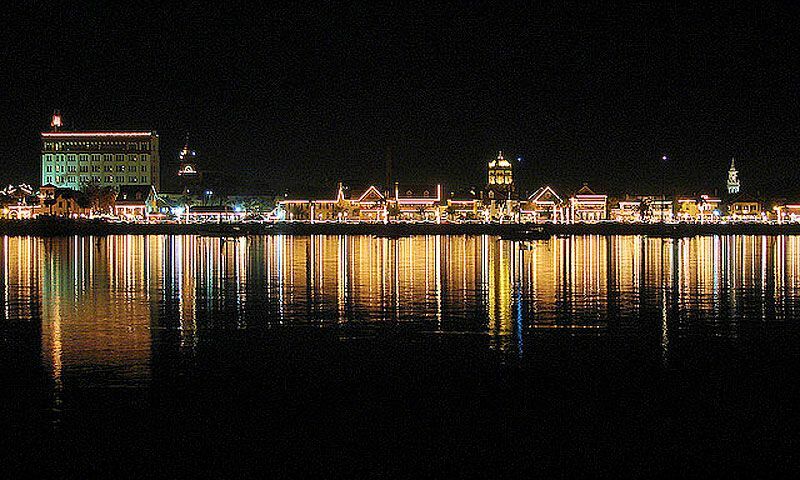 Or, in St. Augustine Florida, go to the Nights of Lights to see the whole town lit up and to the bay front to watch boats cruise by in their holiday finest. I grew up in Florida. Christmas never included snow. I do see white, but its beach sand. What does it look like inside and outside your house for the holidays? We made our own wreaths from cedar boughs or magnolia leaves, decorated with holly and humongous pinecones. Garlands were made of the same material, all of which we gathered ourselves. Table decorations could be palm fronds, magnolia leaves, holly and citrus fruit punctured with cloves. 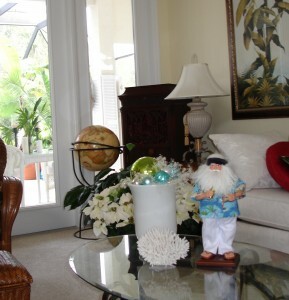 I decorate with Santas in flower print shirts and sandals. On my tree are twinkle lights covered with shells and plastic flamingos and starfish. Outside I see poinsettias in gardens and palm trees, not Fraser firs, wrapped with Christmas lights. After Christmas I see Santa, in his bright print shorts, riding a yellow bicycle on the beach or surfing. No joke! How does Santa arrive at your house? 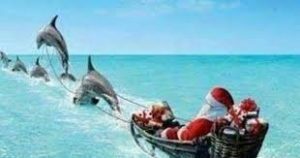 In Florida, sometimes Santa comes in a boat pulled by dolphins or alligators. His helpers are big burly guys called Bubba who help deliver gifts by truck. In Hawaii Santa goes between the islands dressed in print shorts and sandals in an outrigger canoe pulled by four pigs. His helpers are the Menehune. Little people of the islands who live in the deep forest. In Norway he dresses in a heavy woolen red outfit and arrives in a sled pulled by reindeer. His elves help deliver the gifts. Santa appears to some children in a Marine Corps dress blue uniform. How do you say Merry Christmas? Around here it’s likely to be, “Y’all have a Merry Christmas.” Or maybe, according to your heritage, you say one of these. I will also say I’m far more likely to hear boat motors then sleigh bells. In Florida, as I mentioned, many Christmas wreaths and garlands were made with cedar branches. A decidedly different scent than the fir and pine boughs used in northern regions. The citrus punctured with whole cloves. Paper white narcissus. O. My. I can’t describe the scent other than to say it’s Christmas to me. Christmas here feels warm. No need for seven layers of clothing when you are out and about. Even though the evenings can be chilly and damp and a bit foggy this time of year many holiday parties are indoor/outdoor by the pool parties. Or, outside at gathered around a fire pit for an oyster roast. You certainly don’t feel terrified you will slip on the ice and break your bright and shiny hiney or, some reindeer is gonna run you over. 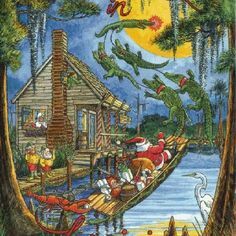 You might want to keep an eye out for gators though. Do you eat what I eat? My Christmas food experience has a Spanish influence. 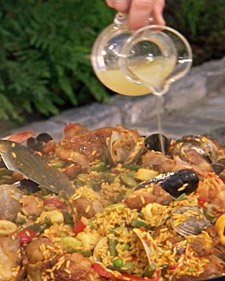 Paella, saffron rice cooked with chicken, pork, and a variety of seafood. Ali Oli, a garlic, mayonnaise like, spread eaten with crispy bread slices. (BTW we were never bothered by vampires) frittata (a potato omelet), roast pork, flan, and citrus rind candy. No Christmas was complete without a Spanish almond nougat candy. With the joys of social media we get to see what Christmas is like around the globe. As are many of you readers. Please share what the sight, sounds, tastes, smell, and feel of Christmas is to you.